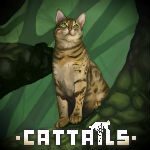 Ability to upgrade den | Cattails: Become a Cat! Uh... if it's not apparent by now, I like collecting things. I'm also running out of space in my den. Maybe there could be a way to dig out a smaller section in the back to serve as a larder of sorts or even a trophy case for all those bugs and bluejays. Kinda like in Harvest Moon (Stardew Valley) games where you upgrade your house to add more rooms. It'll probably work well when the ability to mate and have kits comes along. If I remember correctly, den upgrading will be added to the game since they reached that stretch goal on Kickstarter. I'm not sure when/how it will be added, but I think it's a great idea. Imagine if you could put a pond in your den!